UAV and UAS scales are now available in both platfom and small cell kits. We feature custom build and build to specification scales to meet your requirements. We also build larger platforms for higher weight UAV/UAS aircraft. We currently supply many of the industry manufactures, commercial and military. 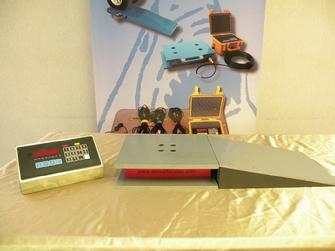 Standard Drone/UAV wireless scale system for 4 point weighing. Easy set up and use, wireless laptop driven, not only weighs but also has our MAP screen with live tiles and print out capability. M2000-3-1KP our larger platforms for larger UAV and UAS weighing operations. Our platforms are available in small and medium and large UAV weight configurations: 100lb platforms, 500lb platforms, 1,000lb platforms and 2,000lb platforms. We have several configurations for weight and indication. The base system is offered with a wired configuration, 50ft cables with three channel digital indication. We also offer the system in our wireless configuration, wireless platforms, laptop computer or hand held read outs, no wires. We are now in production of our wireless scale system specifically designed for weighing light drones and UAV aircraft to meet the FAA 55 lb rule. Our systems are both wired and wireless, cover not only the 55lb and below ranges but also can be used for commercial drone/UAV weighing up to 320 lbs. Please watch the video above and call us with your requests, questions or specifications. www.aircraftscales.com is a division of Jackson Aircraft Weighing Service your #1 choice in aviation weighing scales and applications.